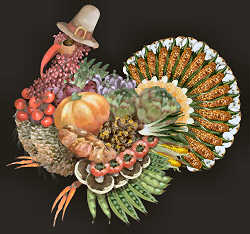 The Hungry Blogger: HAPPY THANKSGIVING! I'll be back blogging and posting new recipes soon. I can't tell you how delighted I am that you're coming back to blogging! My stomach is growling in anticipation! It's about time!! Let's have some recipes before Christmas. We miss you. So great to see a new post from you after so long! I hope you're doing well. Looking forward to some posts and recipes from you!